The gorilla is the largest of all living primates and consists of two species, the Eastern gorilla or mountain gorilla (Gorilla beringei) and the Western lowland gorilla (Gorilla gorilla). The Western lowland gorilla is listed as endangered and is found in the tropical forests of western Africa, from southern Nigeria to the Congo River. Gorillas are heavily built creatures, with broad chests, heavy necks, and strong hands and feet. They are able to stand upright, but prefer to move around by knuckle-walking. Their arms are much longer than their legs, and they can use the back of their fingers as extra feet as they walk. 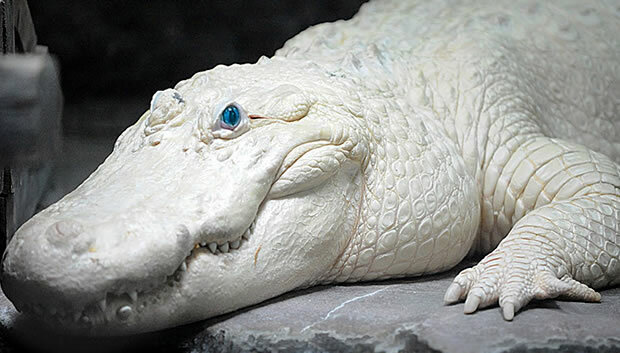 Adult males can weigh up to 450 lb and can reach up to 5 feet 9 inches tall. Females may only grow half the size of adult males. The lifespan of the gorilla is about 50 years. 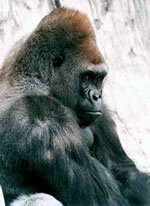 The Western lowland gorilla is found deep within lowland tropical rainforests. Gorillas are mainly active in the morning, and they are peaceful and very social and prefer to live together in family groups or troops with 2 to 20 individuals. The troops consist of one dominant male or silverback and several females and their offspring. Some males become solitary after becoming adults until a troop is formed when other females join the male. In the wild, gorillas are herbivores and feed only on fruits, plants, leaves, and tree bark. Captive gorillas may eat meat, bananas, dry cereal, and raisins. Breeding occurs year round, and the female gives birth to one infant after a gestation period of eight to nine months. The baby rides on the mothers back until it reaches 3.5 to 4 years of age. Gorillas are threatened by illegal hunting by humans mainly for their meat, and some young gorillas are captured and sold. Destruction of habitat due to logging and over-collection by zoos and research institutes also pose a threat. Some gorillas are shot when they attack humans after being provoked. Conservationists have also discovered in a recent study (2007) that a number of these gorillas are infected with the Ebola virus which is depleting populations in protected areas to a point where it may be impossible for them to recover. The now worldwide effort to protect the species has had some success, as there has been a decline in international trade of gorillas. Also, the United Nations Environmental Program (UNEP) has established the Great Ape Survival Project (GRASP), which aims to identify the conservation initiatives required to save the species and to obtain political support and funding for its preservation. Copyright Notice: This article is licensed under the GNU Free Documentation License. It uses material from the Wikipedia article "Western lowland gorilla". Glenn, C. R. 2006. "Earth's Endangered Creatures - Western Lowland Gorilla Facts" (Online). Accessed 4/23/2019 at http://earthsendangered.com/profile.asp?sp=175&ID=1. Need more Western Lowland Gorilla facts?